When it comes to cases that defied the convention tower-look we only have to look to NZXT for inspiration. They were the first to create cases that simply weren't a box. But at CES 2016 this year, a major player has come to market with cases that also defy the box/cube look and that would be CORSAIR. They started to do this a lot more during our visit with them at COMPUTEX 2014 when they unleashed "the keg" case. And more recently, when their new Bulldog System hit the market. Now PC DIY users have even more to be excited about with their new SPEC-ALPHA series. Coming this March, the new Corsair SPEC-ALPHA cases will bring folks looking for a mid-tower case another really great looking option. The cases will feature all the bells and whistles including tool-free construction, fan control, native USB 3.0 support, and room for up to four SSDs. Cable routing is smartly and cleanly routed throughout the case and there is even room for the most high end of hardware thanks to a new "Direct Airflow" case layout that deletes the 5.25" drive bays, allowing air to flow directly across the CPU and GPU areas of the case. It'll even work with radiators up to 240mm in size for additional cooling options. Besides the great angular lines and and striking design, the case will also come with windowed panels and two colour options: red and black. The coolest thing though will be the price however, which we didn't guess as being only $79.99 USD. Additional photos and full press release are below. Bold, modern design and superior cooling capabilities, available worldwide in March. LAS VEGAS, Nevada – CES 2016 – January 4th 2016 - Corsair®, a world leader in enthusiast PC hardware and components, today announced the new Corsair Carbide Series SPEC-ALPHA mid-tower gaming case. With a striking angular design and an oversized window to show off its roomy interior, the SPEC-ALPHA offers a sleek look in either black or red to complement its efficient cooling features. Perfect for PC gamers’ next rig, the SPEC-ALPHA is equipped with three 120mm fans for Direct Airflow Path cooling, controlled by a three-speed switch on the case’s front panel. Uniquely styled with a sharp, stand-out design and LED fans, the SPEC-ALPHA gives gamers a stunning tower that looks as great as it performs. Featuring native USB 3.0 support and room for up to four SSDs, the SPEC-ALPHA is able to handle and hold the best performance PC hardware. With a large side window that perfectly frames the interior space, the case’s cable routing cutouts and tie downs ensure your system maintains a clean look inside and out. The case also allows for tool-free installation and side panel removal for easy building and access. The neat interior combines with a Direct Airflow Path layout for optimal cooling and airflow. With no bulky 5.25” drive cage, the SPEC-ALPHA creates a clear path from the front intake straight to the CPU and GPU. The three-speed 120mm fans adapt to user needs, from near-silent operation to high-performance GPU cooling. The SPEC-ALPHA is also front 240mm radiator compatible, allowing for additional liquid-cooling upgrades. The SPEC-ALPHA case comes in two distinct color options - black and red. The black build offers gamers a strong, sophisticated look with grey accents, while the striking red build features a contrasting red and white design that highlights the case’s angles. The Carbide Series SPEC-ALPHA will be available in early March 2016 for $79.99 MSRP from Corsair’s worldwide network of retailers and distributors and is backed by a comprehensive two-year warranty and Corsair’s worldwide customer support network. Bold Exterior Design with front intake LED fans: The asymmetrical, hard-edged design of the SPEC-ALPHA gives it a bold, unique look. Direct airflow path to keep CPUs and GPUs running cooler: Modern systems don’t need bulky drive cages obstructing the airflow. By removing the 5.25” drive cage, the SPEC-ALPHA has a direct path from the front intake fan to the CPU and GPU. Large side panel window to show off your hardware: Why hide it? All that performance hardware looks great, so why not look at it through the huge side panel window? Three included 120mm fans and built-in three-speed fan controller: Watching a movie? Flip the switch for nearly silent operation. Throwing on the headset for some online gaming? Flip it to high and keep the GPU cool for better framerates. Cable routing cutouts and tie downs: Nobody wants to see a rat’s nest of cables, so hide them behind the motherboard tray to keep cable routing neat, tidy, and out of the airflow path for better cooling. Easy to build: Tool-free drive installation and side panel removal means less time spent building and more time gaming. Front 240mm radiator compatibility: Upgrade to the power of liquid cooling for CPUs or GPUs with up to a 240mm Hydro Series cooler. Native USB 3.0 and SSD support for modern builds: Whether it’s a new external drive for storage or a new SSD for the user’s preferred OS or games, the SPEC-ALPHA is ready for anything. 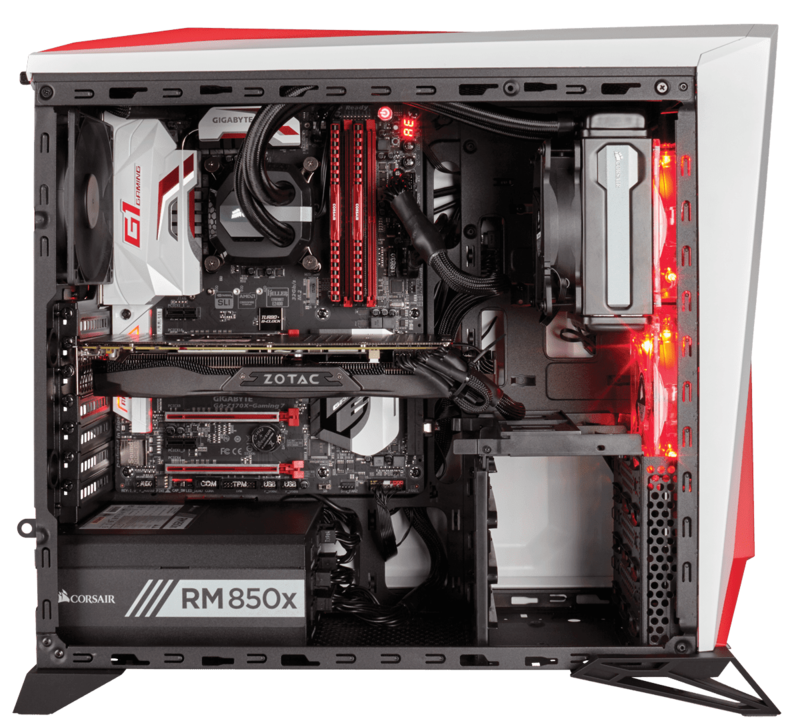 Founded in 1994, Corsair supplies high-performance products purchased primarily by PC gaming enthusiasts who build their own PCs or buy pre-assembled customized systems. The company's award-winning products include DDR3 and DDR4 memory upgrades, computer cases, PC cooling products, gaming headsets, gaming keyboards, gaming mice, power supply units, USB flash drives, solid-state drives and system monitoring and control devices. Copyright © 2015 Corsair Components, Inc. All rights reserved. Corsair, the sails logo, and Vengeance are registered trademarks of Corsair in the United States and/or other countries. All other company and/or product names may be trade names, trademarks, and/or registered trademarks of the respective owners with which they are associated. Features, pricing, availability, and specifications are subject to change without notice.